Former South Korean president, Park Geun -hye has been arrested over a high-profile corruption scandal that has already seen her ousted from office and prompted early elections. A court approved her arrest before dawnon Friday, on charges of bribery, abuse of authority, coercion and leaking government secrets. 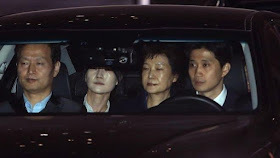 The 65-year-old was immediately driven to a detention centre in the south of Seoul after the Court approval. She is accused of allowing her close friend Choi Soon-sil to extort money from companies, including Samsung, in return for political favours. 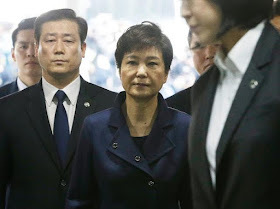 However, Ms.Park who was removed from office earlier this months denied the claims. 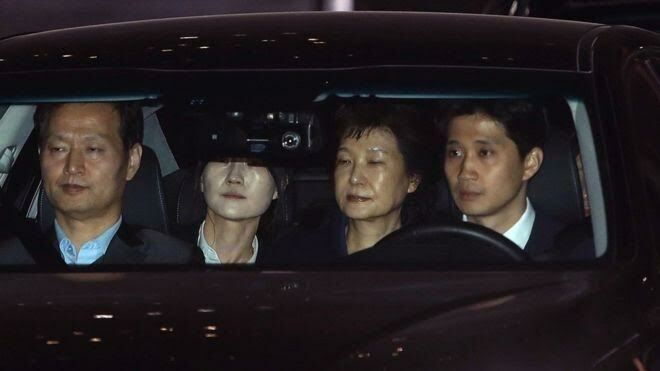 Park Geun -hye, the third former president of South Korea to be arrested over criminal allegations, could be held for up to 20 days before being formally charged. If convicted she could face more than 10 years in prison.